Fujifilm’s Instax range of products like cameras and printers are currently one of my favourite gadgets. The Japanese brought instant cameras back and made them cool again (sorry Polaroid) and made me want one back with the Instax Mini 7, which I bought. And then sold it for the Mini 8, and then the Mini 90. You could say I became obsessed with the brand, and it’s the reason I love reviewing their products, except I need to stop buying all of them. 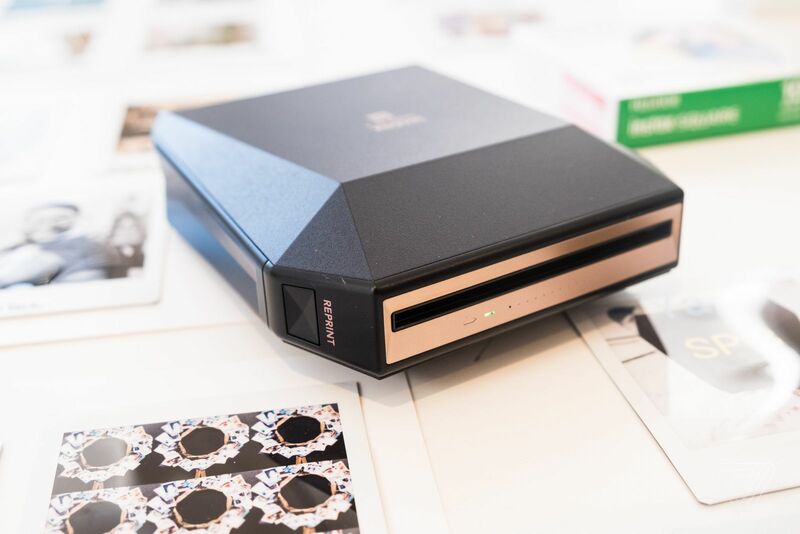 Enter the Instax Share SP-3 printer. This cute little printer is portable and can travel with you or sit in your handbag so you can print out pictures directly from an Android or iOS device. It has a rechargeable battery so make sure you’re all powered up before heading out; it takes 3 hours to recharge. It should suffice for your day or evening out because you’re not going to be sitting there printing pics all day. Fujifilm says it can handle 160 prints in one charge. The Share SP-3 is different to its predecessor, the SP-2 in that it has been redesigned with a more angular/geometric look, which I quite like. And the biggest difference is the size of the printout; it’s no longer a credit card sized, but rather a square print out (1:1 ratio). It’s 62mm x 62mm (2.4 inches) in size with 318dpi; and a thick bottom border so you can scribble a caption. What I love about this printer slightly more than the instant camera range is that you can print pictures off a smartphone or tablet. This also means that if you’ve taken high-res photos on a DSLR and have it on your mobile device, they can be printed too. Versus snapping from a camera, which don’t get me wrong, also has appeal (and it’s cheaper) but would be only as good as the quality on the camera. But it doesn’t matter once you see the printout has the same retro vibe to it. It’s really simple to set up: switch the printer on, and connect to it over WiFi; the default pairing code is 1111, and there’s no reason to change it. Once you’re paired, download the Instax Share app (Android and iOS), and you’re ready to start printing. The app would of course need access to your gallery etc, or if you want to connect social media accounts, you can do that too. I have not done that because I’m not on FB anymore and prefer not to print lower-res photos off Instagram when I can select it straight from the original. I found the reliability of the connection to be better on iPhone than Android, which got disconnected after a few print outs to the point I just switched to printing from my iPhone. The only reason I did this was a) I don’t have patience and b) I have two phones filled with photos. Had I been exclusively on Android, this would not be an issue, I’d just have to reconnect. Once you’ve selected a photo to print, you have the option to edit it to your liking. They include flipping and zooming/cropping; adding filters (black and white, sepia, intelligent); and custom (changing brightness, contrast, saturation). There’s also a template option to add captions but it has a limited edition sticker on it; or to print a collage; and a photo split. So you could take a square image and print it over 4 or 9 blocks. Printing takes about 13 seconds and thereafter you wait until the colour darkens. The quality of the print depends on how high-res the photo is. I printed pics from a DSLR camera and they looked amazing, and I also printed a lot of smartphone pics, which looked good. You can see the difference but the ones that are not as crisp look very retro, as it was printed 20 years ago anyway. They basically look like a filter with a warm/fuzzy effect. So yes, they all look good. I wouldn’t suggest printing low-res photos though. Anything from a smartphone over the last while should be good. Aside from connecting to socials like Facebook and Instagram, you can pull photos off Dropbox, Flickr, and Google Photos too. And if you feel like it, you could opt to take a photo directly from the app. I have not tried that but would recommend you just use your regular camera mode and pull from your gallery. You can also reprint pics instead of re-editing for more of the same photos. The Fujifilm Instax Share SP-3 printer is a fantastic little gadget to own, but it does not come cheap. It has a recommended retail price of R3499 and film is available separately. It uses the square format, priced at R189 for a pack of 10; slightly more than the regular credit card ones. It can be purchased on Takealot and ORMS, who are in the process of listing it online. However, it does appear on the Outdoor Photo website for R3525.